Here he is! 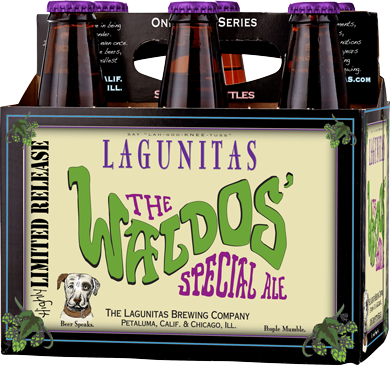 Waldo's Special Ale is Lagunitas' finest beer in their extra large portfolio of beers, High Westified and Born Yesterday notwithstanding. This year's 11.5% version is as deceptively drinkable as the previous year's, though the high ABV may be the beer's only flaw. Hard for me to justify drinking multiples of these on a weeknight, but it's so hard to stop at one bottle. The drinkability is one of the things that makes this such an accomplishment. What other beers in this ABV range are as light and easy to put down? Maharaja? No way. Devil Dancer? Hell no! Pliny the Younger comes to mind, but you can't walk into Jubilation and buy a six of Pliny the Younger, though I'm sure many have asked! And the price- what, like $12 for a six-pack? 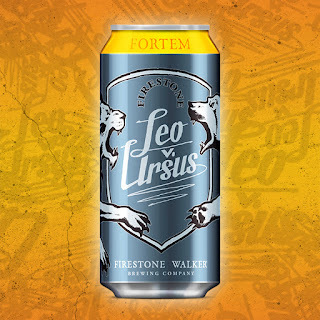 Well done, Heineken Jr.
With Fortem, the first rotating DIPA in the Leo vs. Ursus series, Firestone Walker puts its name in the UNFILTERED beer category (also joining Avery in the dead-language Latin category of beer). Because, as we all know, an IPA isn't truly an IPA unless it's UNFILTERED. For one, though, the beer is mostly clear, which is sure to disappoint haze-heads. And second, doesn't Firestone Walker know that an IPA can't be taken seriously unless it comes in a can with a wraparound sticker label? That's how you know an IPA is truly legit. As FW themselves put it, "Fortem has been left unfiltered for a full hop impact." Yeah, impact on their sales by calling it unfiltered! All idiocy aside, Firestone Walker has released their best DIPA yet. No, it isn't hazy, but it does have that great mouthfeel people are looking for these days. Way toned down from Double Jack's 9.5% to 8.2%, Fortem has the low-bitterness, high juice factor. Non-believers who put it next to a Monkish DIPA to look for flaws should put it next to a Great Divide Hercules DIPA...then tell me it isn't a modern DIPA. A four-pack of 16 oz. cans goes for $13.99 at Whole Foods on Carlisle- certainly a modern DIPA price!